DDOT is introducing more than 500 new e-bikes (Capital Bikeshare Plus) to its bikeshare fleet. 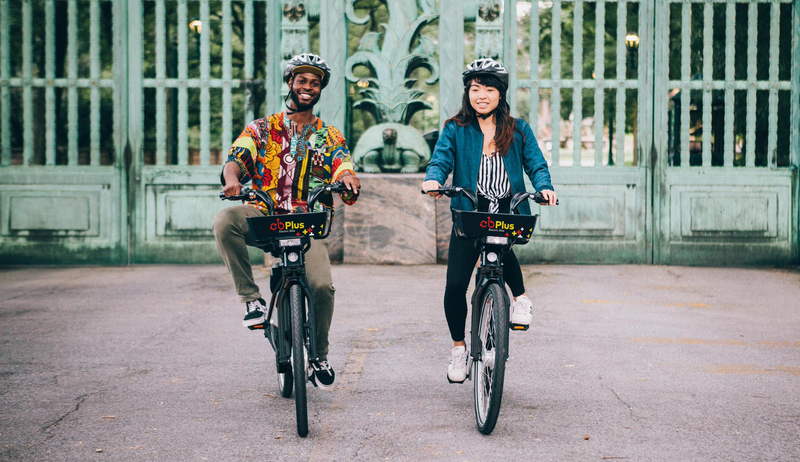 Promoting a vibrant bike culture has been one of the District Department of Transportation’s (DDOT) core goals since DDOT debuted the first bikeshare program in the United States in 2008. More than a decade after the agency helped mainstream the concept of bikesharing, DDOT is helping to infuse its bikeshare program with some new energy: Capital Bikeshare will add more than 500 e-bikes to its fleet by the end of April. These e-bikes, called Capital Bikeshare Plus (CaBi Plus), will be rolled out in phases and added to more than 80 e-bikes that are currently in the bikeshare fleet. Capital Bikeshare is adding 100 new CaBi Plus bikes each week, phasing the bikes into the bikeshare fleet incrementally so battery swapping operations can be scaled up over time (Capital Bikeshare staff is charged with swapping out dead or dying batteries on CaBi Plus bikes with fresh ones). In addition to injecting hundreds of battery powered e-bikes into the Capital Bikeshare system, the District Government has recently launched two other programs to encourage biking in the city. On February 26, Mayor Bowser announced a new partnership to give free annual Capital Bikeshare memberships to District veterans. The free memberships were made possible through a partnership between Capital Bikeshare’s Community Partners Program and the Mayor’s Office on Veteran’s Affairs (MOVA). The Community Partners Program enables local nonprofits, government agencies, and social services organizations to offer their clients a deeply discounted Capital Bikeshare annual membership. District veterans can learn more about registering for the program and receiving a free helmet by calling MOVA at (202) 724-5454 or by visiting MOVA’s website. DDOT has also continued its push to install bike racks throughout the District as part of its #RackAttack campaign. To meet increased demand for bike parking, the agency installed 298 bike racks in 2018 and has installed almost 80 bike racks so far this year. 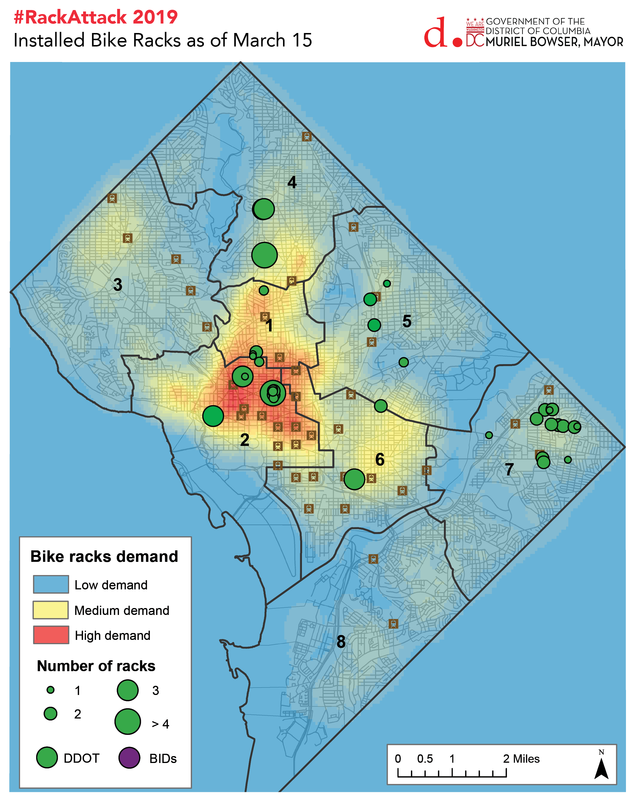 However, the number of bike racks that the agency has installed in 2018 and 2019 combined are not even equal to the amount of new bike parking that DDOT has planned for FY 2020. As part of Mayor Muriel Bowser’s DC Vision Zero budget for FY 2020, DDOT plans to install 500 bike racks throughout the District. To request a bike rack in your area, please contact DDOT at 202-673-6813 or at ddot@dc.gov. A heat map of the different locations where DDOT has installed bike racks this year. This commitment to modernizing the Capital Bikeshare fleet, offering free bikeshare access to District veterans and expanding the city’s bike parking infrastructure are just a few of the many ways that the District is ensuring that it continues to lead the way in fostering a vigorous bike-friendly culture in the city. This entry was posted in Bike, DC Vision Zero, General, Transit, Uncategorized. Bookmark the permalink.